﻿ Best Price on Acajou Hotel in Grande Riviere + Reviews! This eco-friendly hotel is in Grande Riviere Bay between the river, the beach and the mountains. 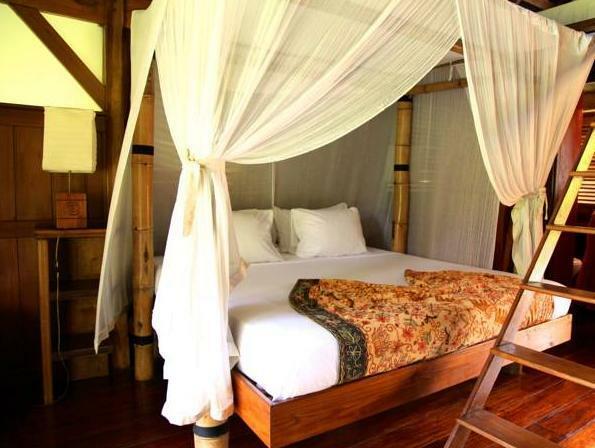 It features free Wi-Fi throughout the property, bird watching and turtle watching tours and free private parking. The cottages at Acajou Hotel offer tropical décor, a fan, mosquito net and river views. The bathrooms are private and have shower. The on-site restaurant features a mix of Swedish and Trinitarian cuisine and the Acajou’s menu also offers local and continental influences made with organic products from the garden or from the local farmers. Acajou Hotel can arrange boat tours, airport shuttle and shuttle service for an additional charge. In season, guests can enjoy watching turtle hatchlings surface from the sand to the sea. This property is a 5 minute walk from the bird watch site and an hour’s boat ride from Paria Falls. Piarco International Airport is 2 hours and 30 minutes’ drive away. Please keep in mind that there are no cash machines in the village. Please inform Acajou Hotel of your expected arrival time in advance. You can use the Special Requests box when booking, or contact the property directly using the contact details in your confirmation.